Cran-Clearance is a 12:1 cranberry (Vaccinium macrocarpon) concentrate containing the organic acids found naturally in fresh cranberries. 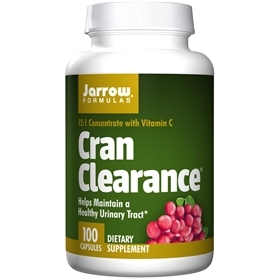 Moreover, cranberries contain unique phenolic compounds possessing an Anti-Adherence Factor that helps to maintain the health of the urinary tract (uroepithelial cells). Take 2 capsules per day, in divided intakes, or as directed by your qualified health care consultant. Store in a cool, dry place.